There are two big explanations for why rural counties, small towns and even medium-sized cities have fallen behind America's largest, most innovative metro areas when it comes to job growth and new business formation . One is primarily about those "left-behind" areas: The sort of businesses and jobs they used to create in economic expansions simply aren't appearing at the same rate anymore, particularly in blue-collar industries such as construction and manufacturing. The other explanation is about the superstar cities, and what they have that the other places don't: high-growth startups, which often means high-tech startups — the sort of businesses that spring from engineering and brainpower, and which continue to spawn new companies and jobs in an increasingly service-oriented U.S. economy. Both stories are, at least in part, about seed money. There is evidence that prospective entrepreneurs in lower-income areas, including many rural areas, are struggling to borrow money in this recovery. It doesn't help that many of those areas have seen home values rebound more slowly than in wealthier areas; borrowing against home equity has traditionally been an important tool for Americans to launch their first small businesses. The seed money for high-growth startups, in contrast, rarely makes it out of a handful of big U.S. metro areas. 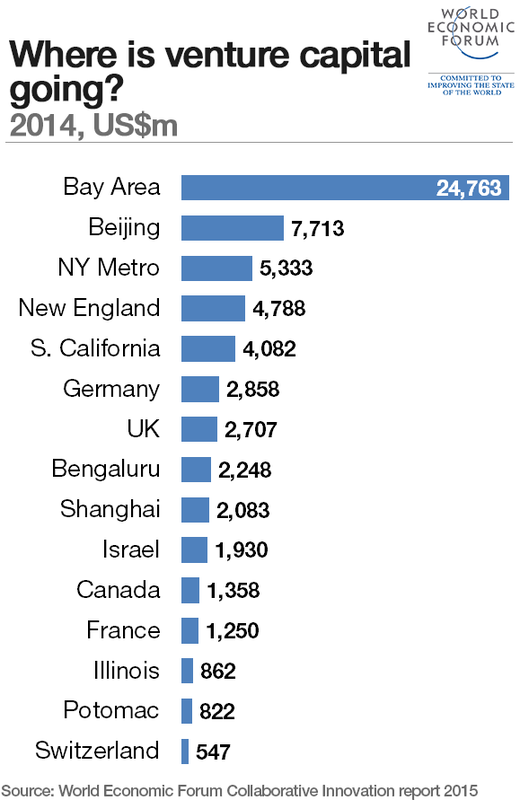 Two-thirds of all venture capital money flows to just six metro areas, according to Thompson Reuters statistics. The top two areas, San Francisco and San Jose, account for 40 percent of all venture funding on their own. The next quarter of funding splits between New York, Boston, Los Angeles and Washington. Researchers say that stat is important in explaining how there are more than 3,000 counties in the United States, yet only 20 of them managed to combine for half of America's net new business formation in the first five years of this economic recovery, according to a new analysis of Census data by the Economic Innovation Group in Washington. Those 20 counties include parts of Silicon Valley, Southern California and the greater New York City area, all top venture capital destinations. Venture capital helps seed what economists at the Brookings Metropolitan Policy Program call " advanced industries ," which you can think of as the tech sector writ very large. Those industries are the backbone of many of the superstar areas highlighted in the EIG analysis. They're innovative and they pay extremely well, and they employ 8 in 10 engineers in the United States. And if anything, they're becoming more concentrated, geographically. "Big cities are increasingly the sought-after platforms for the kind of high-creativity, high-productivity knowledge-research-and-technology work that is increasingly the main source of U.S. growth," said Mark Muro, the policy director for the Brookings Metro program. "Scale matters because it maximizes the possibilities, whether for accessing critical tech, hiring the right person, and immersing in a cutting edge business community." One of the first questions for policymakers to tackle, if they want to slow that consolidation, is how to get more startup seeding into areas that aren't superstar cities. The folks at EIG favor a bill called the Investing in Opportunity Act , which is pending in Congress and would create tax and other incentives for such investment. Which raises the larger, potentially thornier question about those left-behind areas: Do they need more of the elite brainpower that currently flocks to the superstar cities, and would the presence of venture capital lure them away? If you fund it, in other words, will they come?